The state has paved the way for Costco's experiment in extreme vertical integration for years. But farmers and activists brought together in opposition envision another way forward. Read more on Civil Eats. With sows producing 23 piglets a year on average, intensive farming is called into question over rise in animals suffering prolapse. Read more on The Guardian. The knowledge and tools to sequester carbon on farmland have blossomed rapidly in California; now farmers and ranchers just need funding to make it happen. Read more on Civil Eats. Jimmy Emmons isn’t the kind of farmer you might expect to talk for over an hour about rebuilding an ecosystem. And yet, on a recent Wednesday in January, before a group of around 800 farmers, that’s exactly what he did. 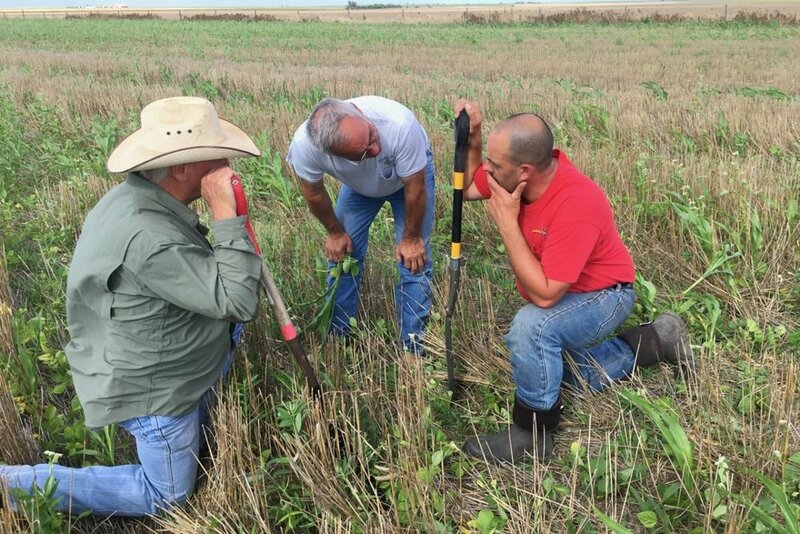 After walking onstage at the Hyatt in Wichita, Kansas to upbeat country music and stage lights reminiscent of a Garth Brooks concert, Emmons declared himself a recovering tillage addict. Then he got down to business detailing the way he and his wife Ginger have re-built the soil on their 2,000-acre, third-generation Oklahoma farm. Read more on Civil Eats. It has been a rough few weeks for Tyson Foods, the nation’s largest poultry producer. On Sept. 5, the company announced that it was planning to build a $320 million poultry complex outside of Tonganoxie, Kansas — a relatively well-appointed bedroom community in Kansas City with a population of 5,300. The plant was designed to be a first-of-its-kind, fully integrated operation that would have included everything from a hatchery to slaughter and processing. If you follow Sir Francis Drake Boulevard down the Point Reyes Peninsula toward the lighthouse, beyond the now-vacated Drakes Estero, you might find yourself at Historic Ranch B, also known as Double M Dairy. Here, Jarrod Mendoza raises dairy cows on land his family has ranched for generations. Despite its sweeping views and windswept vistas, the 1,200-acre ranch isn’t large by today’s standards. The certified organic milk from the 250 cows Mendoza manages usually only fills half of the refrigerated storage tank that is kept in a low-ceilinged room beside the milking parlor. When Jarrod’s father, Joey, ran the ranch using conventional methods, he grazed 500 cows at a time, and the tank was always full. Now, Mendoza sells his organic milk to Straus Family Creamery. The move to higher-priced organic has allowed him to produce less and give each animal access to more pasture during the winter and spring when seasonal rains bring the grass on his land to life. Read more. The Forest for the Trees: Agroforestry in the U.S.
On a windy afternoon in Marin County, California, rancher Guido Frosini reached down into a clump of weeds, pulling back the dry stalks to reveal a sapling so small some might not recognize it as a tree. But Frosini’s voice swelled with pride when he saw the cork oak, still covered in leaves that looked strikingly green against the drought-bleached backdrop of rolling, golden hills. Read more.